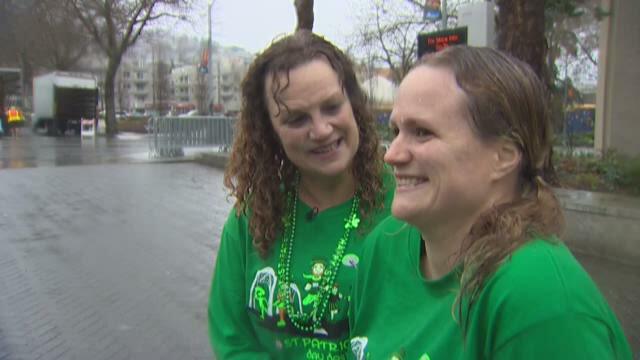 A handful of Seattle streets were closed Sunday morning for the city's annual St. Patrick's Day Dash. Thousands of runners braved soggy conditions to finish the 5K. For Sara Clerget, finishing the race was about going to the distance for an important cause. "It was a good run, it feels really good" Clerget said a short time after crossing the finish line. It was nearly a year ago when Sara's heart stopped just steps after she finished the Seahawks 12K race. "I went over to the barrier and I sat down and I had my cardiac arrest," she explained. "My heart was just quivering, it wasn't pumping the blood to my brain, so I basically just passed out and died." CPR by two other runners and a shock from an automated external defibrillator, or AED, brought Sara back to life and gave her a new mission. "I didn't know anything about it," she explained. "People hear sudden cardiac arrest and they think oh she must have some clogged arteries." Cardiologists believe an electrical problem in her heart caused her cardiac arrest. Sara now has a defibrillator implanted in her chest and is working with the Puget Sound Heart Project to get AEDs into all Tacoma schools. So far, there are AEDs in high schools and the group just received a grant to put them in middle schools. They're now trying to raise money to put them all the Tacoma elementary schools. Sara's mother and sisters were among those who ran Sunday's race with her. "I'm so proud of her, so many emotions around this as you can well imagine and then to think that she's worked so hard to help others and get the message out" Julie McKee said. 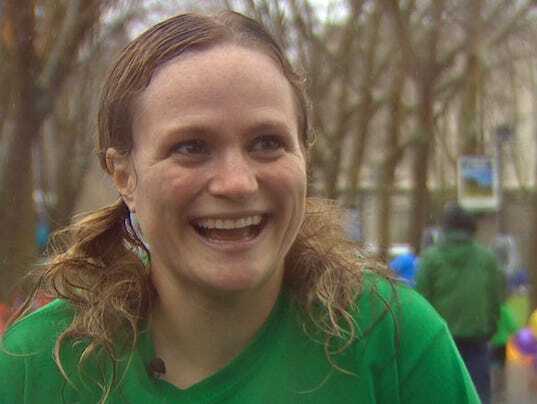 Friends and family plan to be by Sara's side next month when she returns to the Seahawks 12K. "It feels wonderful. I'm lucky, I'm very lucky " Sara said. She says crossing that finish line will be another joyful step towards saving others.